Talk about nights at different extremes. Two nights ago had to rank as one of the most boring nights of the past 2 years. Not only were a small number (6) meteors seen by my deep cameras, no meteors were seen by my wide-angle fireball camera. For a clear night you should see at least 3 or 4 bright ones. Last night (Sunday, March 14) was better. 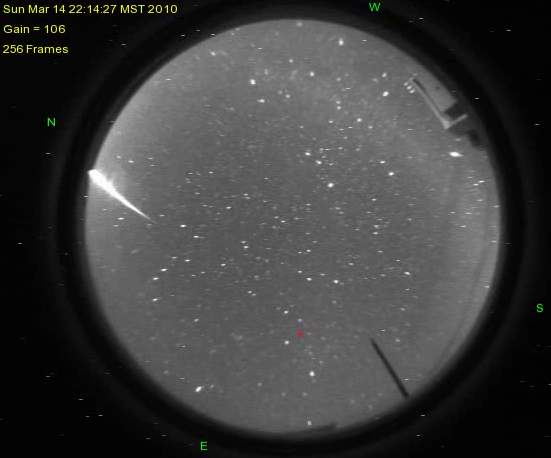 What really set it apart was a bright fireball seen over Tucson at ~10:14 pm (5:14 UT). Both of my cameras picked it up. The first movie shows the very early stages of the fireball. Since my SALSA2 camera only has a FOV of about 50×70 degrees, this camera was lucky to see any of it. In the movie the fireball is moving nearly due north (north is to the bottom) and first becomes visible just to the north of Leo. The near-all-sky cam on Mount Hopkins caught another view of the fireball. Hopkins is located to the south of my place so the fireball appeared further north. MMT all-sky camera on Mount Hopkins. Credit: Tim Pickering/University of Arizona. The fireball was also seen on all-sky cameras in Sierra Vista and on Mount Lemmon. Interestingly, a brilliant fireball was observed to the west of Sacramento, CA at almost exactly the same time. The jury is out as to whether the AZ and CA fireballs are one and the same since they could easily be unrelated. If anyone witnessed the fireball, especially observers to the north of Tucson, leave a comment and let us know. Let's hope tonight brings another one.